NEW SHIMANO S-PHYRE ROAD SHOE - LA VELOCITA. 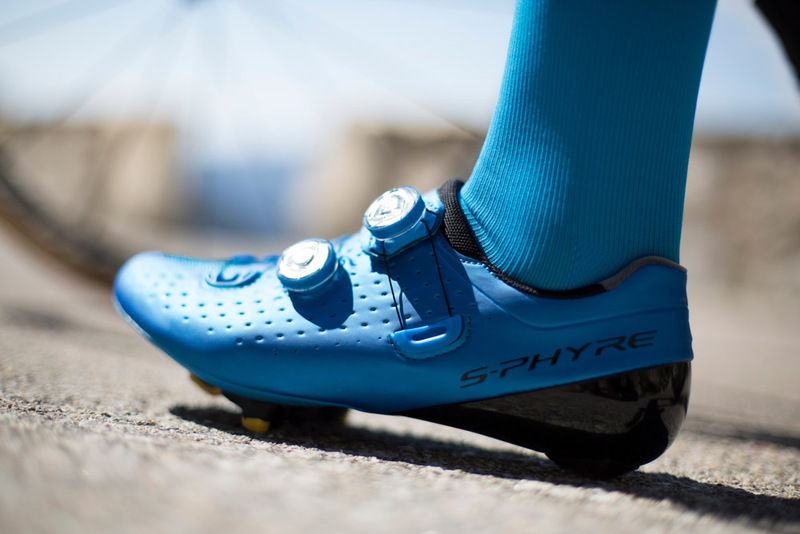 Shimano has announced its new road shoe, the 'S-PHYRE' RC9. Our first quick peak of these shoes had us wanting to smuggle them out the room. These shoes are nice. Very nice... In fact I'll be first in line to grab some when they are released in the next month or so. When I chatted with Shimano it became clear that these shoes have been in testing for a long time, with some of the top performers in the sport using them during this year's Tour de France. Those of you with eagle eyes may have noticed some of the pro peloton getting about in test versions. In normal Shimano fashion, Shimano has thrown a tonne of tech at these shoes. The aim being to get every ounce of power out of your body and into the cranks.The S-PHYRE gets BOA dials. The RC9 shoe is the top end shoe in the range. There is a one-piece outer is made from supple, stretch-resistant and highly breathable Teijin Avail microfiber synthetic leather, with perforated dimple vents. The closing mechanism is handled by two independent Boa IP1 dials with wire lacing to allow quick and precise micro-adjustments. An external heel cup, along with the elimination of the lasting board helps reduce weight to a claimed 232g and allows for maximized power output through the ultra-rigid carbon sole. The RC9 will be available in blue, white and yellow (I'm loving the blue) from sizes 39-52 including a range of half sizes and wide fitting options. A added touch to these shoes is that they will be supplied with colour matched S-PHTYRE socks. The socks are 'long ankle racing socks'... sounds fast. The socks have temperature-regulating sole ventilation, cushioning comfort in pressure areas, anatomically contoured construction with woven-in ankle guides, anti-slip heel stability, with an extra-tall cuff that’s guaranteed not to drop. Now we just need to wait for these to land and get a hands on (or foot on) review happening. Watch this space.